This recipe is incredibly easy to pull together, and although it takes about an hour to make, most of that is hands-off baking time, and there’s only about 5 minutes’ worth of prepping and chopping. Simply slice the squash in half, scoop the seeds, and pop it in the oven for 20 minutes to soften up. While it’s baking, chop an apple and mix it with nuts, butter, lemon and sugar. Finally, brush the squash with melted butter and spices, stuff it, and toss it back in the oven to roast to golden perfection. Enjoy! Preheat oven to 400 degrees F. Place squash cut side down in a baking dish. Pour in enough boiling water to reach a ½-inch depth. Bake for 20 minutes. Discard water and flip squash over to be cut side up. Leave the oven on. 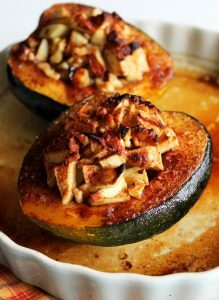 While squash is baking, combine chopped apple in a small bowl with 1 tablespoon of melted butter, the lemon juice, zest, walnuts and brown sugar. In another small bowl, combine cinnamon, salt, cayenne and nutmeg. Brush squash with remaining 1 tablespoon of butter and sprinkle with the cinnamon mixture to cover (you may not use it all). Fill the squash halves with the apple mixture and sprinkle with additional cinnamon mixture. Pour ½ cup water in the bottom of the baking dish (to prevent the juices that ooze out from burning and sticking). Bake for 25-30 minutes, until the apples are tender and everything is golden brown. Serve immediately, drizzled with any pan juices.